Conor Thomas, A young 17 year footballer who was playing for Coventry city but now joins Liverpool on loan basis. He has played matches for England for Under-17 International Tournament. After seeing his performance in Under-17, Aidy Boothroyd announced him as a young emerging footballer for year 2011-2012. In this article I will explain biography, career statistics and best performance of English footballer Conor Thomas. Conor Thomas is great young Football player, who is still 17 years in age. He was born on 29th October 1993 in England. He is selected as the midfielder for Coventry City youth Academy. He got its first invitation call from Aidy Boothroyd, who called him up for first team squad against Walsall on 24/07/2010 where he has played for last 6 minutes and his team wins that game with 2-0. He joined his academy 2 years ago, where Coverty manager Aidy Boothroyd got impressed with his excellent performances and decided to give him a future option. He is not getting any chance to play as a squad member but his U-17 performance sets excellent platform for Coventry first team sooner. His bright future is not too much far away. Thomas has officially given the 40 number Shirt for this season. He was selected as one of 4 players who are promoted to the first team for league Cup which is to be take place at Morcambe. On 28th July 2009 under U-17 tournament, Conor was given the chance to play for England and match ended with a tie with 1-1 as in 71st min sub. 29th July 2009, England won against Foroe Islands by 8-0 after playing for all 90 mins. On 2nd August 2009, England won a match against Scotland by 3-2, which called off after 62 mins. 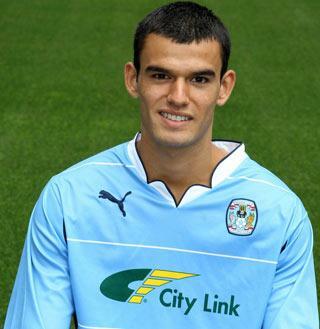 As Mentioned above that Conor Thomas is an English Professional footballer who plays for Coventry City as a midfielder. He got very less experience of International as well as Club career. Earlier, he was playing for Coventry city and made his professional debut as a substitute on 8 January 2011 in a 2-1 FA cup which was won by his team against Crystal Palace. He replaced Gary McSheffry after 72 minutes but within few days he made his full debut on 25 January while playing against Birmingham City. On 31st of January, Thomas Joined Liverpool on a loan with a view to a permanent move for his career. Thomas was playing for Under 17 International squad where he played his first match in year 2009 at Nordic Tournament. He was also awarded as a winner medal while playing against Scotland. In November, he called for a standby for England Under 18 squad.